Join Water of Life tonight as they minister the gospel in word, song and power. Terre reads a message from Zimbabwe describing severe storms and God’s protection of twelve locations where Living Water of Life congregants meet. 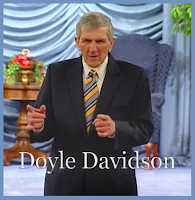 Doyle shares several testimonies of God’s protection in his life and others in the midst of storms, and declares, “The authority of this ministry reaches the four corners of the earth; there is safety with this ministry, it reaches a lot of people.” He, Kathie and Terre talk about the constant war he has been in the past months and all he continued to overcome and accomplish by the Spirit of God, in the midst of the constant battle. He relates the difficult night he experienced last night and his determination to get an answer, “Why is it so hard? What is going on?” Kathie joined him in praying and God ministering to him 2 Corinthians 12, the messenger of Satan sent to buffet him, and he states, “Suddenly I had strength to fight with faith…my spirit stood up stronger…” At Doyle’s request, Anthony ministers John 10:1-29, “…My sheep hear my voice, and I know them, and they follow me…” and Doyle talks about hearing and obeying his voice, when he sold his hospital and practice. He also informs the listeners that he frequently sees a man with wolf hair on his nose, a man he knows, that is in their presence.